Flooring comes in a variety of styles and materials to meet your needs. The material used for your flooring should be determined by several key factors. The floor of a home possesses the largest surface area aside from the walls and is subject to the most wear and tear. For this reason, it is important to use a high-quality material that can sustain foot traffic and general use for years to come. Carpet is easily one of the most personalized options for new flooring. With a wide variety of colors and design patterns at an affordable rate, carpet has reserved its position as a staple in many homes. Carpet can be the design element needed to pull an entire room together. Whether you are matching the carpet to existing furniture and fixtures, or completely renovating a room. Nothing transforms a room more than a new coat of paint. 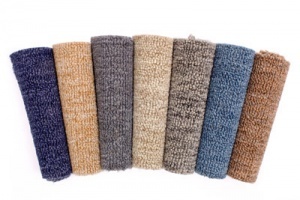 Carpeting can withstand constant foot traffic and can be cleaned easily with the pass of a vacuum cleaner. In recent years, stain-proof and spill-proof carpets have made clean up the simplest task. Carpet is foot-friendly. With various textures and softness levels, bare feet are welcome without the cold, hard touch of other flooring. Tile has been a staple flooring material for thousands of years and can be derived from a number of different source materials. 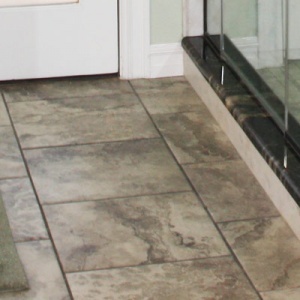 Cleaning tile is easier than most flooring options and can usually be done with nothing more than warm water, removing the need for chemical cleaners. Ceramic – Formed from clay materials that are processed and formed into a mold, ceramic tile can be used for many applications. Most often seen in bathroom and kitchen settings, ceramic tile is easily cleaned and doesn’t harbor germs. Ceramic tile can still be found in ancient Roman and Egyptian ruins, lending to its durability as a material. Porcelain – A subtype of ceramic tile, porcelain is most often seen in commercial applications due to the toughness of the material. This material, however, has become popular in residential applications based on its design potential. With low porosity, porcelain generally requires a special compound to set the tile. Stone – One of the most fashionable choices, stone tile can be made from a variety of source materials and is well sought after for its aesthetic qualities. With modern and rustic patterns, stone tile is usually made from marble, granite, slate, or travertine. One of the most sought after flooring choices, hardwood is renowned for its aesthetic qualities. A classic hardwood floor creates a warm atmosphere and is considered more luxurious than tile or carpet. By eliminating the color palette required with carpet and tile, décor options are limitless. Hardwood is an excellent thermal and acoustic insulator. By retaining heat, it will give a comfortable walking surface for years to come while creating a lasting cozy feeling in your home. Hardwood floors are a resilient and durable material. Most hardwood can last for decades with proper upkeep and cosmetic issues that arise can easily be rehabbed. Hardwood floors are easily cleaned. Unlike carpet, spills can be wiped away from the surface of hardwood and can easily be swept without damaging the materials. With a monthly clean and polish, the floor will shine. Hardwood is a good option if you have allergies. 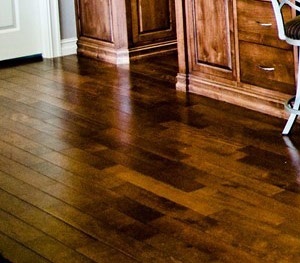 By creating a non-binding surface for dust and irritants, hardwood can be easily cleaned to remove them. Made from composite wood pressed together at high temperatures with the image of hardwood placed over it, laminate flooring is a cost effective way to obtain the wooden floor look. As hardwood flooring is composed solely of harvested trees, laminate is a more affordable option. Because of the way laminate is manufactured, it has many durability features. The surface of laminate is more scratch resistant than other wood floorings and is less prone to moisture and use damage. Laminate flooring is easily cleaned with the use of a vacuum or broom. When the floor shows visible dirtiness, it can easily be cleaned with a slightly damp mop or laminate cleaner. Unlike hardwood flooring, laminate is created to have a consistent, uniform look. Given the implementation of locking mechanisms. Installation of the floor has become a simplified process. Manufactured from the bamboo plant, bamboo flooring has been promoted as an eco-friendly alternative to hardwood floors. One of the fastest-growing plants in the world, some species can grow up to 3 feet within 24 hours. Bamboo has been sought after in recent years for its hardness characteristics. Given proper treatment, high-quality bamboo will wear at the same rate as a traditional hardwood floor. Different processing methods can make bamboo more durable than red oak. One of the least expensive flooring options, vinyl can be purchased in either sheet or tile form. Vinyl flooring has become a popular option due to its wide variety of designs, color choices, and inherent value. 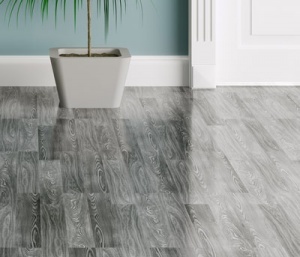 Vinyl flooring tends to have a softer surface than wood or tile counterparts while retaining flexibility and give. This feature will make the flooring more supportive to the homeowner during long periods of standing. 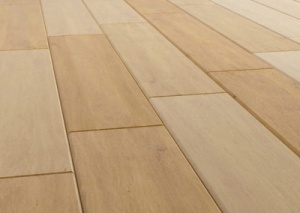 Vinyl flooring can mimic the aesthetic of stone tile and wood. While the difference is noticeable, the value is unmistakable. Vinyl comes in a variety of colors and styles to match any décor setting. Vinyl requires little maintenance and cleaning. Vinyl is naturally resistant to dirt and water making it a rugged material. Whenever the floor is dirty, vinyl just needs swept and mopped to give a clean finished look. All of the mentioned flooring options can be installed in home or commercial settings. When determining a floor type it’s recommended to weigh the pros and cons of the material used. Depending on the design and style you have to achieve, we can help you find the floor you need. To find out more about our flooring options, contact us, or give us a call at 918-779-7330.